Fortis Hospital Mohali, under the aegis of Saarthak – a support group for cancer survivors, organized a session on ‘Positive Healing’ by Brahmkumari Prem Lataji. 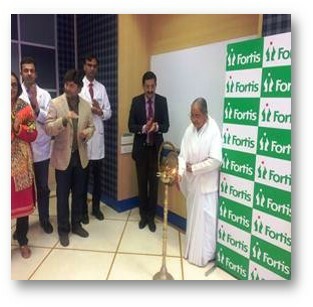 The purpose of this meet was to offer continuous support for the well-being of our patients. The programme started with a ceremonial lamp lighting by Brahmakumari Prem Lataji, Dr Rajeev Bedi, Director, Medical Oncology, and the oncology team as well as patients. Dr Abhishek Puri, Dr Naval Bansal, Dr Sumeet Jain, Dr RP Doley,Dr Arunjit, Sister Harman, and the oncology team were present for the session.Prem Lata ji enlightened the audience about the importance of being positive in life. Positive thoughts have the power of healing. They enhance the well-being and peace of mind, thus leaving no space for anxiety, negative thoughts and depression. The session was well appreciated by the audience. MrRamasubramanium, Regional Head, N&E, Marketing, presented a token of gratitude to Prem Lataji.